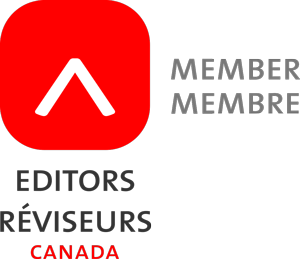 My membership in the Editors’ Association of Canada includes a subscription to its listserve (chat forum). The subject of a current discussion thread is the value of a copy editor, which began with a complaint that if Dan Brown had been provided with a copy editor for his latest novel The Lost Symbol (and his previous novels), he didn’t make much use of him/her. You can read the rest of the post at: www.scottberkun.com/blog/2009/what-copyediting-looks-and-feels-like/ And again, the comments following Mr. Berkun’s post are particularly enlightening. So please remember that, as your editor, I will indeed let you have the last word, as I promise in my tag line. You’re the author, after all. But you’re paying me to edit your work, and I do so with a passion, eight to ten hours a day, often seven days a week. I hope you’ll trust my expertise and experience.